A highly unstable night of thick clouds and high humidity. No observations. No observations on this cold night with high humidity and heavy clouds. Did not open due to high humidity and clouds. A shorter night than the previous ones. We were forced to close due to the weather. But we could do a high priority observation at the beginning of the night, which was aimed at observing the eclipse of a White Dwarf binary. Another great night without any problem. We could observe two high priority programs. One aimed at observing the eclipse of a white dwarf binary. We could observe (and see) the passage of one star behind the other one, resulting in the dimming of the light coming from the unresolved object. the second one was a joint observation of a Black Hole binary, together with the VLT and SWIFT, and X-Ray satellite. We did some needed HRS calibrations. We received a notice at the beginning of the night, to inform us that the observations we did on one high priority object yesterday allowed the astronomer to determine the type of the supernova we observed. It is a Type Ia. Great to see results coming so fast after we do the observations! Another very productive night. No downtime whatsoever. Another good night, with relatively good seeing, and no clouds. Incredible night, tonight. Seeing stayed well below 0.8 for most of the night. We recorded 0.49 as the lowest seeing we measured during the night. Not a single technical problem. Weather was incredibly cooperative, with no clouds to be seen anywhere. The night started quite well, with good (to excellent) seeing. But the humidity constantly rose, to the point where we had to close. We managed to squeeze a couple of observations during some short period of time with lower humidity, but then, we had to close, this time for good before the end of the night. => No any observations tonight because rain, snow and strong wind. => Heavy clouds and high humidity all the night. No any observations. => Clear sky, very strong wind and bad seeing all the long night. => Clear sky and variable seeing. Finally were closed by humidity. The Southern African Large Telescope (SALT) Foundation and South African Astronomical Observatory (SAAO) are delighted with the success of the SALT Science Conference 2015 held in Stellenbosch from the 1st to the 5th June. The programme was jam-packed with talks, poster presentations, practical workshops and discussions showcasing SALT’s capabilities. Over ninety astronomers and education professionals attended the conference representing over twenty nationalities. Delegates from international astronomical institutes from seven countries attended the conference to foster scientific collaborations and enhance partnerships with the South African astronomical community. Education and outreach professionals also contributed to the conference programme in recognition of the pivotal role that SALT has played in the advancement of astronomy and science education and in skills development within South Africa. Construction of the SALT telescope, just outside Sutherland in the Karoo, was completed in 2005. Following initial testing and performance verification the telescope started full science operations in late 2011. 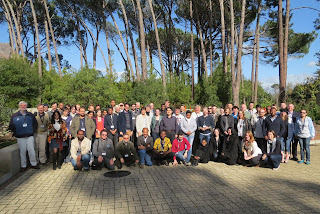 The SALT science conference, held in Stellenbosch from the 1st - 5th June 2015 brought together scientists from around the world to celebrate the success of SALT and to foster new scientific collaborations. "Our aim is to position Africa as a global centre of research excellence for multi-wavelength astronomy, with optical, radio and gamma-ray telescopes working together to achieve common scientific goals." "South Africa pursued the SKA project by using the lessons learnt from SALT as the basis for our planning and partnerships. The links we developed through the SALT project allowed us to build on existing networks and partnerships to secure the iconic SKA, an extremely important strategic initiative that puts science and technology to work for the benefit of all Africans." "We have been very successful in training and supporting teachers and curriculum advisors in the teaching of Natural Science and particularly the theme ‘Earth and Beyond’. Through programmes such as the national astronomy quiz we have succeeded in using astronomy to inspire curiosity and critical thinking among learners. Through our exciting job shadowing programme, we are spreading career information pertaining to astronomy and related science." For the remainder of the conference the focus shifted to the practicalities of optimizing the use of the telescope and showcasing the recent exciting and varied science conducted using SALT observations. “Since the start of science operations, SALT has been producing exciting science at a comparable rate as similar telescopes at the same stage in their operations, but at a fraction of the cost. This is a huge compliment to the SALT staff and the astronomers working with the observatory. " SALT operations staff also held several training workshops during the conference to help potential SALT users apply for telescope time and to aid them analyse SALT data products using software tools developed by the SALT team. In terms of science, the areas covered ranged from planetary science, stellar astrophysics to studies of galaxies and the distant universe. A large portion of the conference focused on the variable universe, a niche area for SALT’s unique capabilities. SALT’s imaging instrumentation is tailored towards achieving high time resolution observations of varying objects and transient (short-lived) objects. "Listening to the talks at the conference from an operational point of view, it was extremely gratifying to see so many scientists, from students to professors, getting results from SALT. People are finding out exciting things about the Universe from analysis of the data we have been dishing out to them under the Sutherland night skies for years, it makes the work worthwhile." Finally, the conference finished with considerations and prospects for future SALT science. Dr Marsha Wolf from the University of Wisconsin, US, detailed the proposed extension of SALT ’s capabilities into the near-Infrared region of the electromagnetic spectrum. If implemented this will allow astronomers to observe even more distant objects than is presently possible with SALT. This is because the light from distant galaxies is 'redshifted' into the near-Infrared as a consequence of the expansion of the Universe. Extending into the near-Infrared will also allow observations of objects that are enshrouded in gas and dust which are not possible using visible light alone. Prof. Bruce Bassett, joint Professor at SAAO, UCT and AIMS in Cape Town introduced methods that he has developed employing computer algorithms to automate the classification of transient objects. The volume of data that astronomers will need to analyse will increase significantly once the SKA comes online and automating data analysis wherever possible will be crucial in order to fully exploit SALT and SKA in the future. One of the key take home messages from the conference was the importance of using SALT together with other ground based and space based observatories such as the SKA radio telescope and the European Space Agency’s Euclid satellite mission. The prospects for SALT and astronomy in general within South Africa are brighter than they have ever been. Exciting times lie ahead, however, to fully understand the wonders of our Universe it is now clear that astronomers will have to adopt a multi-wavelength approach and peer at the skies with a combination of telescopes! SALT and SAAO would like to thank the NRF and DST for funding the SALT Science Conference 2015. => Clear, unstable night with good seeing. Couple of times we were closed by high humidity. => Heavy clouds, high humidity and rain during the night. No observations. => A weekly set of HRS calibrations was taken. Do you want SALT data? The Salt science conference 2015 was held last week in Stellenbosch. One of the talks there was specifically directed to all SALT users, on how to maximize your chances of actually getting the data for your program. This would be useful reading to anyone considering proposing for SALT time in the next Call for Proposals coming out in July. Some important aspects include making use of optional targets, Bright time which is under-subscribed, P4 time, and planning for both seasonal and nightly visibilities, i.e. beware of tight tracks and Moon constraints. SALT Astronomy Operations is planning to publish more tips and tricks for the upcoming Phase-1. And feel free to contact us at any time for more questions at our 'salthelp' address. The weather gave us little gap to try and take science. Some blocks were attempted, but had to be rejected due to weather deteriorating dramatically or instrument failure. Clear night with decent seeing throughout. A photometric night with 1" seeing for most the night. With excellent technical support to help us overcome a few difficulties at the start of the night, on-sky time lost was minimized. After some initial technical problems (likely due to not opening the last couple of days), the clouds became too thick and we were unable to do any observations. No science data taken. Copious amount of calibration data taken for Fabry-Perot mode. Thick clouds most of the night and sub-zero temperatures reached. Humidity remained too high throughout. The first snow of winter briefly covered our plateau in a centimetre or two of fresh powder before the rain washed it away a few hours later. Rain continued throughout the night. - The bad weather continued tonight. Did not open. - A severe cold front kept us from opening again. The humidity was above 90% for most of the day and we had lots of rain through the night. - Did not open tonight due to bad weather.